Every time a kid’s birthday party approaches, my sister-in-law LizE asks what they would like, and usually I instruct, “You just do you.” Because she just happens to be the best gift giver on the planet. When my kids were babies, I suspected this was because of her career as an occupational therapist, where she helps kids develop their motor and fine motor skills. 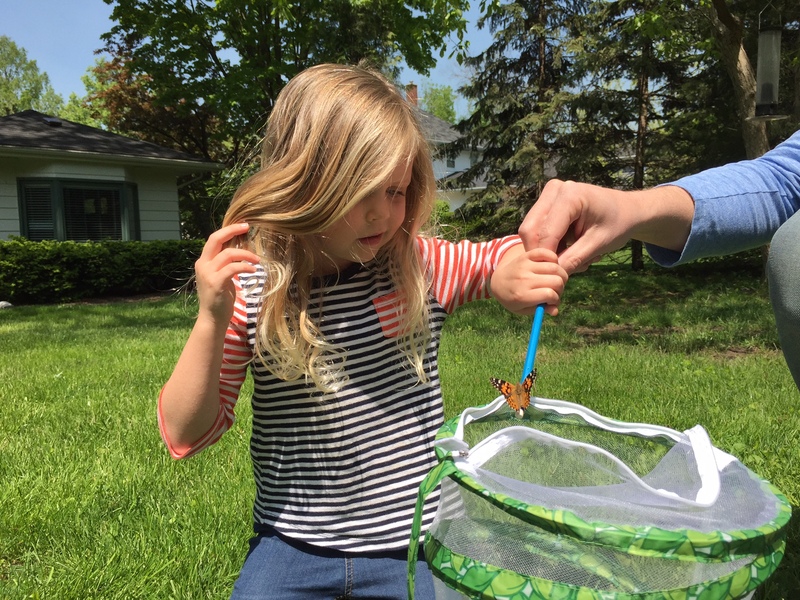 Because of this, she is required to know, in a noncommercial way, what makes a toy a good toy—engaging, developmentally appropriate, and helpful in some way that I would never suspect because the kids loved the things so darn much. But as the kids have gotten older and are moving beyond her professional expertise, she continues to deliver. So now I know for sure that she is so good at giving gifts because of a huge amount of thoughtfulness, which makes up the core of who she is. For Vivvi’s 4th birthday, Auntie LizE outdid herself in the most spectacular way—a way that will be impossible for her to top ever, so I feel she can retire as the ultimate gift giver right now. Which is hilarious, considering that when it comes down to it, she gave us bugs. I say “us” because this ended up being a project for the whole family to enjoy. 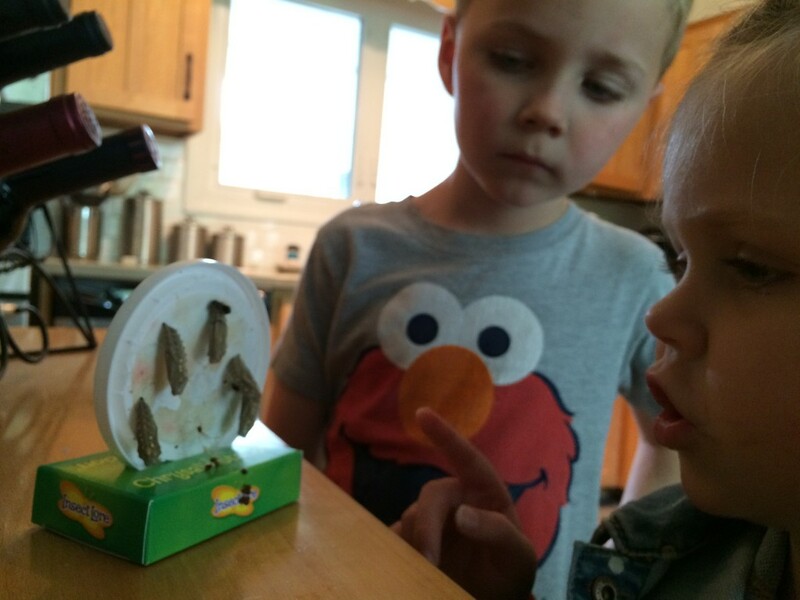 The project was Insect Lore’s Butterfly Garden—where you can watch caterpillars become butterflies. 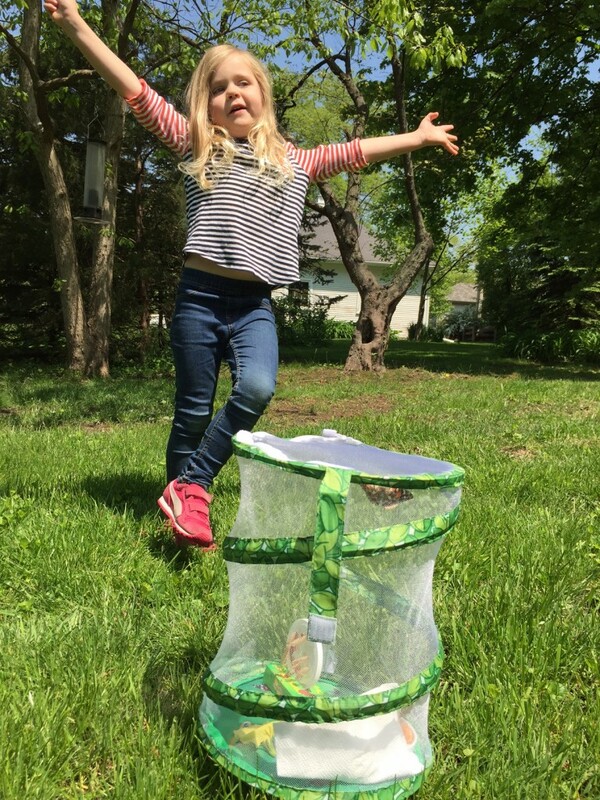 The kit comes with a net and a voucher to order the live caterpillars, so you can decide when you want to do it. 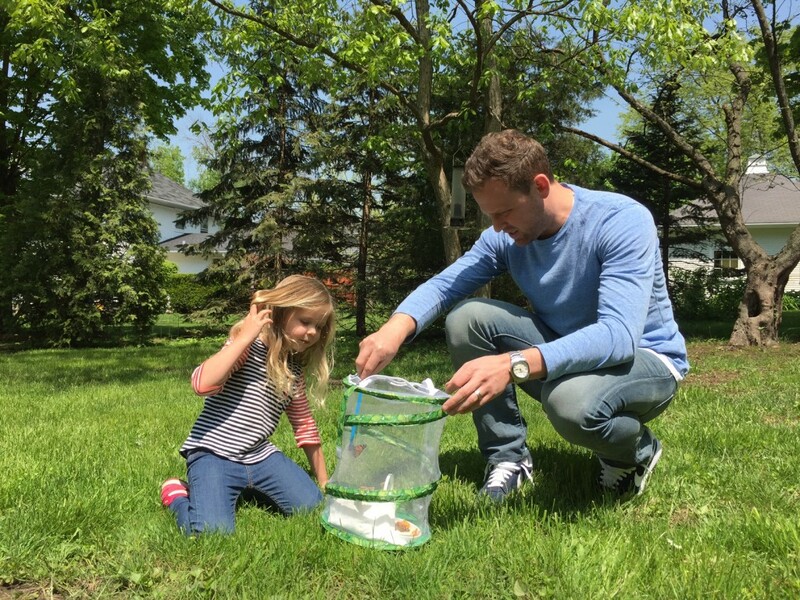 They just ask that the outside temperature is 55 high during the day, so when you have full butterflies, you can release them. 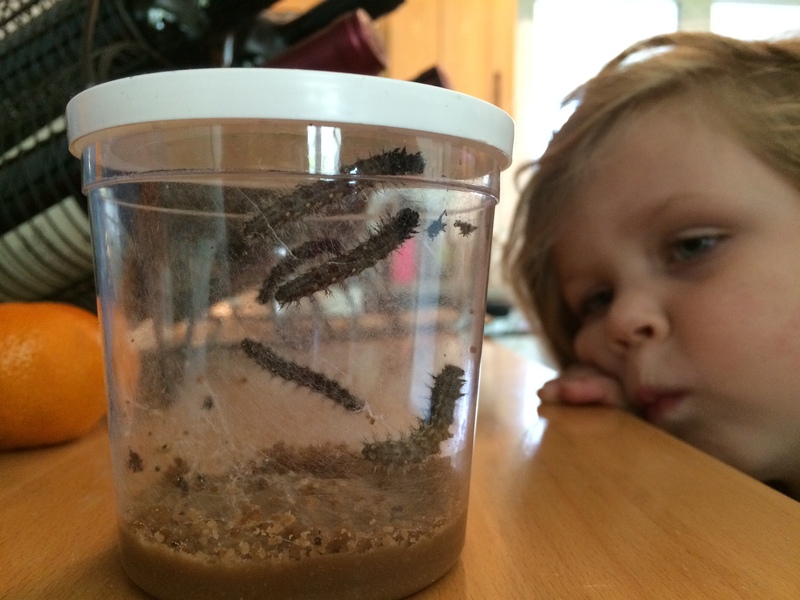 We ordered the cup of caterpillars, and a few days later, the jolly postman showed up with a box. He saw me in the kitchen as he came up the walkway, and in a way he’s never done before, he held the box above his head and shook it around like a maniac who hates bugs, who hates science projects, who hates life, really, and the process of life and wonder and joy and all things good. Really, he was just indicating that we had a package that he’d be putting by the door, but these were our new babies and my mama bear instincts were outraged. 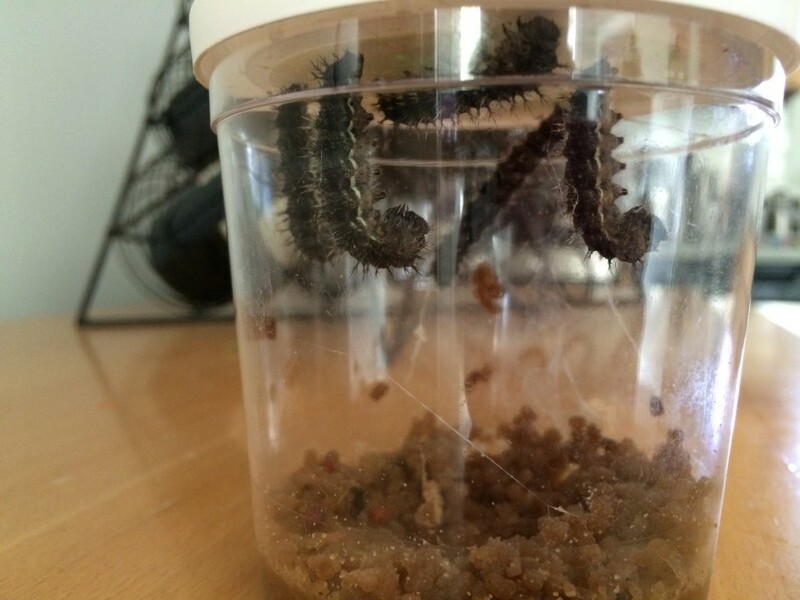 I ran to grab the box, which I was sure would say on it, “Fragile, life inside, do not shake around like a maniac,” but instead it just said, “Your caterpillars have arrived.” Phew. They were probably safe. We opened the box, and there they were. Five tiny guys. “Now we have 6 pets!” Wally5 said. 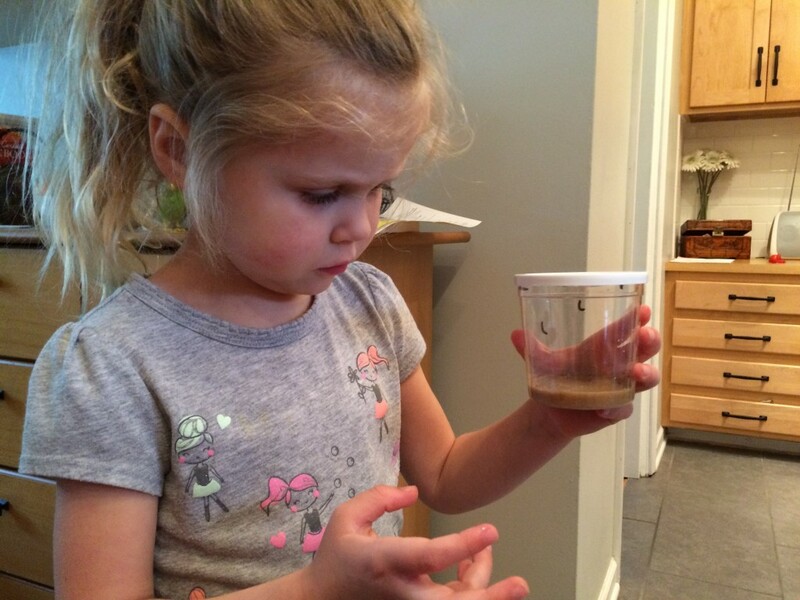 “Our worms are here!” Vivvi said. 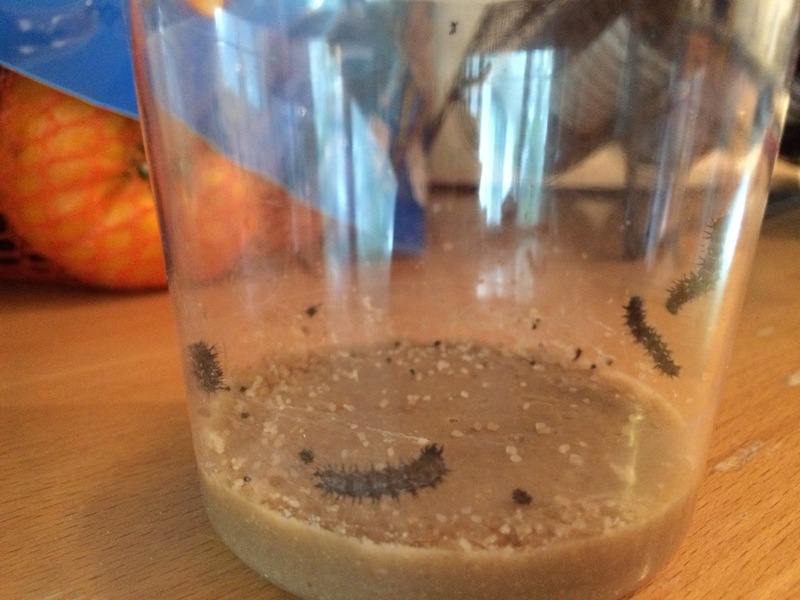 We watched them wander around the cup for a minute, which is packed at the bottom with a brown substance that they tell me is food (but I seriously question because it looks like brown cement). Then we went back to our business. A few hours later, Wally5 checked again. “Their getting bigger!” he said. “Look, Frank and Hungry won’t stop eating!” I checked, and wasn’t sure, but thought he might be right. They did seem slightly bigger. 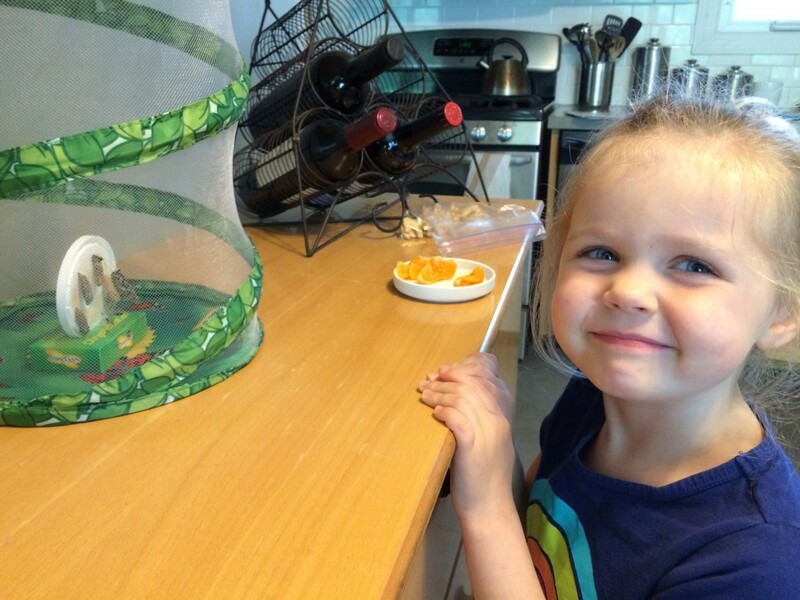 “Awww, worms, are you hungry? Okay, love you,” said Viv. 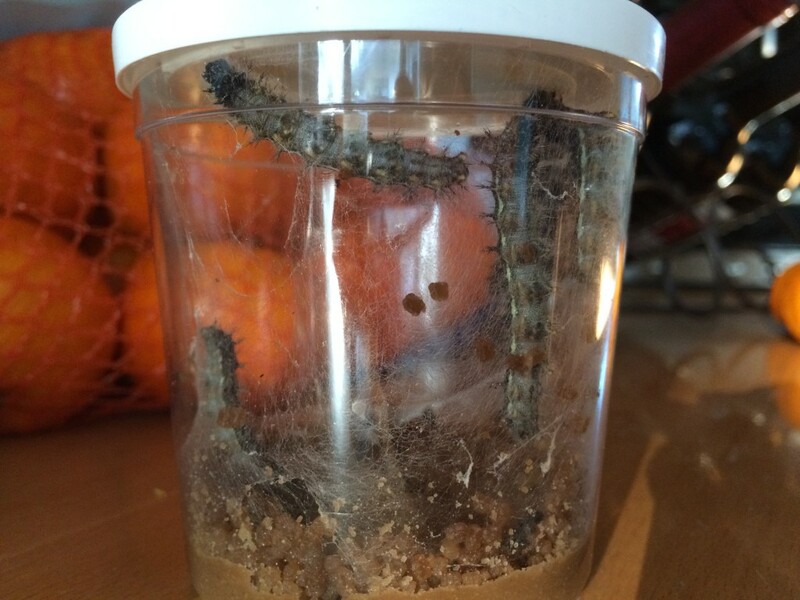 Over the next 7 days, I still questioned whether it was food, but not because I thought it looked inedible—instead, it was because our new little friends grew a noticeable amount every time I checked. This wasn’t food—it was a magical medicine that packed in one-piece-of-chocolate-cake-one-ice-cream-cone-one-pickle-one-slice-of-swiss-cheese-one-slice-of-salami-one-lollipop-one-piece-of-chocolate-cherry-pie-one-sausage-one-cupcake-and-one-slice-of-watermelon. I suspected we’d have 5 tiny stomach aches soon. Every time we checked the cup, we gasped at their new size. They grew before our very eyes. Three started the process of hanging upside down when they were good and fat. Two poked about near them, wondering what their little friends were doing. “Silly keeps bothering everyone else,” Wally5 said. “Okay, worms, go to sleep now,” Vivvi said. 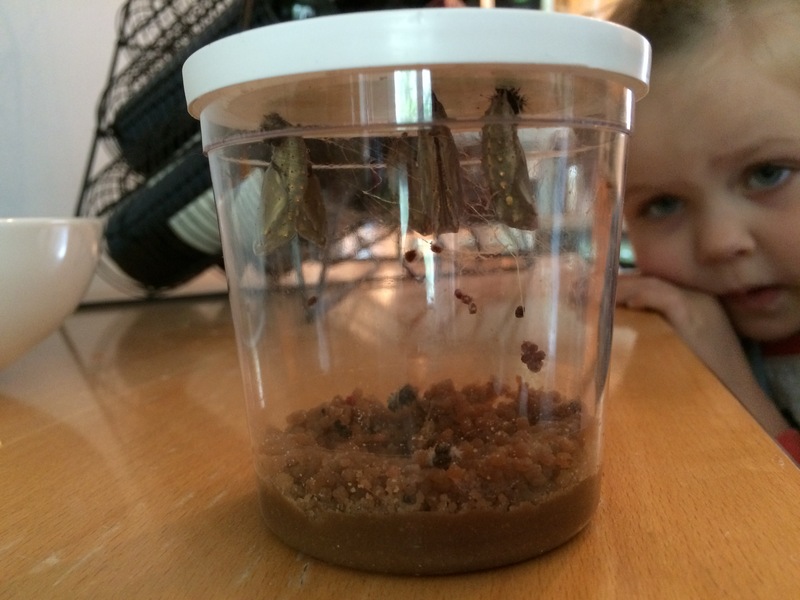 Then, we waited as each formed a chrysalis, shelled up, closed themselves off from us for a while. We didn’t check them often, because they didn’t give us much to see. 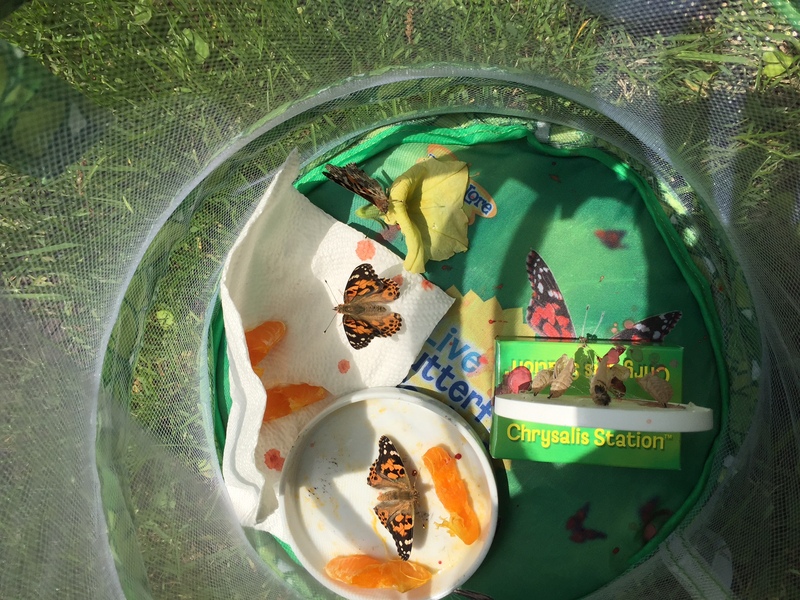 Once they were fully shelled off, we moved the cap of the cup to the butterfly net so they’d have space when it came time to emerge. And then, one day, Vivvi and I came home in the morning to discover that one of our new little friends had decided he was ready to come back to us. He stood there, undramatically—so still that Vivvi hadn’t even noticed he was there when I told her to check. Welcome back! I thought, as we stared at each other through the net. Then we picked up Wally from school and sat vigil like the world had stopped turning so we could see his friends join us as well. I scraped a lunch together while we stared. I turned on music to encourage them. With U2’s With or Without You blaring, Wally said, “That’s good music. It sounds like he’s about to be born.” And then, it happened. This witness to science, to creation, to wonder, and to God had me gushing to everyone I saw about it for days—the kids’ teachers as I dropped them off with an excellent excuse for being late, our neighbors, friends, the jolly postman. Over the next 2 days, the rest came out. 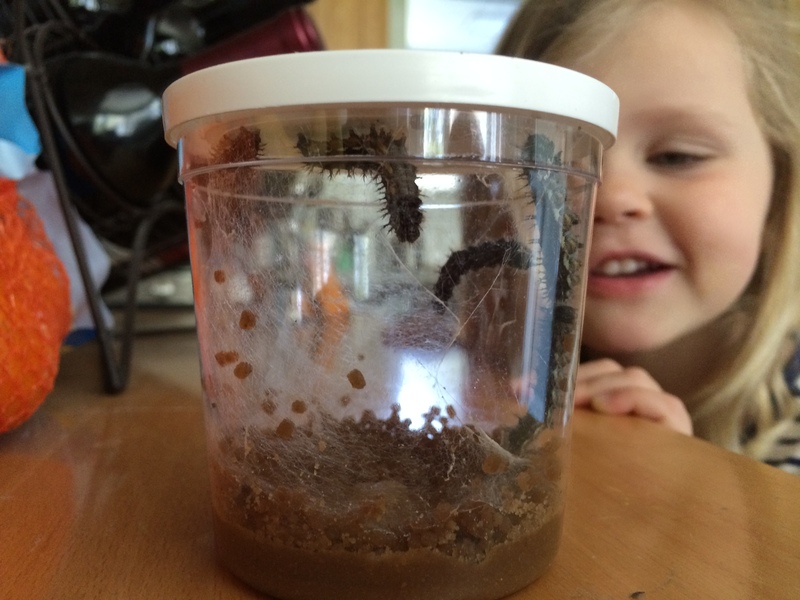 The rapid growth of the caterpillars alone would have been enough. Add to it the chrysalis, the emergence—the whole experience was exhilarating. And then one of the best parts—we got to set them free. Wow that is really cool! My kids would love this!